Over $100,000 in Scholarship Funding Now Available! The Nexstar Legacy Foundation is giving away more than $100,000 in scholarship funds available for students furthering their education in order to enter the plumbing, heating, cooling or electrical residential service industry. Scholarships specifically for veterans and women are also available! To apply, visit the www.nexstarfoundation.org and select the application that best fits your educational area of interest. Deadline to apply: March 31, 2016. This scholarship is funded by a memorial fund and available to women who are planning a career in marketing in the plumbing, HVAC or electrical industries. Jill Reed founded RedClickMarketing, a marketing agency and call center for heating, cooling, and electrical contractors. Frank Blau is a retired plumbing contractor from Milwaukee, WI who owned a hugely successful business called Blau Plumbing. Frank spent even more of his career traveling the country dedicating his time to teaching contractors how to determine the correct selling price, embrace the concept of flat rate pricing, raise the bar in our industries to the professional levels they so deserve and to earn a successful living while protecting the health, safety and welfare of our nation. Frank was the original founding father of today's Nexstar Network organization in 1992 and has transformed literally thousands of contractors' lives, and that of their families, with his teachings. He continues today to mentor contractors all over the world, who are willing to learn and "take the medicine." This scholarship is permanently funded by the foundation and offered each year. It is based on merit and open to all students applying for the Management Scholarship. Learn more. Jim was a highly-decorated veteran - serving two tours in Vietnam, receiving numerous medals of honor including a purple heart. During his second tour, Jim was shot down and captured as a POW, soon escaping and freeing his comrades. 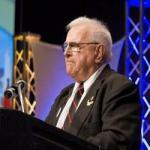 Jim later devoted his life to the betterment of contractors, teaching them sound financial advice and business acumen. He was an early supporter of Nexstar and was able to deliver a common-sense approach to understanding the financials of plumbing and heating companies. He was a man of great intellect and compassion and assisted many Nexstar members in becoming stronger business leaders. These trainings are available to veterans. To apply, fill out the Troops To Trades Veteran Training application. Learn more. The AC Pro Scholarship of $5,000 is open to any military personnel who are transitioning out of the military, have already transitioned out of the military, or active Reserve or Guard members. Applicants must be enrolled or enrolling in an HVAC technical training program. A DD214 must be submitted to complete the application. This scholarship is funded by AC Pro, a supplier of heating and air conditioning products with locations in California and southern Nevada. In 1985, AC Pro was founded on the core values of integrity, courtesy, and service. Where better to search for individuals who can carry these values to the HVAC industry than our own armed forces? AC Pro created this scholarship for individuals coming from the armed forces with these values in order to give them the opportunity to gain the skills needed to begin a rewarding career outside the uniform. Learn more. Other scholarships are available as well. Check out all of the scholarships available by clicking here. Honor Someone By Naming a Scholarship For Them! Since 2006, the foundation has given away scholarships totaling $200,000. This generosity and support has helped dozens of individuals start or advance their career in the trades. Join in this support while honoring a loved one by naming a new scholarship for them. To set up a scholarship as a legacy for your loved one, friend or mentor, contact Renee Cardarelle at 651-789-8518 orreneec@nexstarfoundation.org. Pippin Brothers also offers a scholarship for students that want to stay semi local! We will pay 90% of tuition and books of your second year.